This is our small lanyard that you can attach to just about anything. 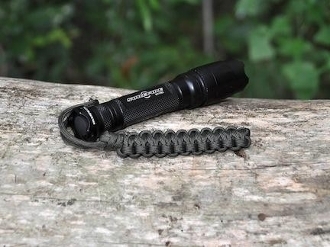 They go especially well on knives and flashlights. You can get it with a swivel clip on one end, and a small split ring on the other end. Or, you can get it plain. Attach this little guy to just about anything. We can do custom colors. Select the custom color option and tell us what you want in the comments section of your order or send us an e-mail. There is a 10 lanyard minimum for custom orders. E-mail us for a bulk discount on orders of 15 lanyards or more.